This modern, comfortable hotel is the perfect choice for vacationers, with a fantastic location on International Drive offering easy access to some of Florida's most popular attractions. Three tropically-inspired swimming pools offer fun and relaxation for the entire family. Spacious and comfortable rooms feature free WiFi and a host of amenities. Some rooms offer private balconies and floor to ceiling windows with stunning views of Orlando's cityscape. Located on International Drive, across the street from the Orange County Convention Center and just minutes from Walt Disney World® and Universal Studios® theme parks. 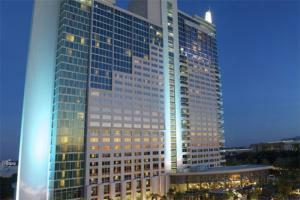 The hotel is approximately 12 miles from Orlando International Airport.